Social psychologists and peace scholars have both contributed a great deal of knowledge of the factors that enhance or inhibit conflict and the likely effectiveness of practices and interventions that address such conflict. However, contributions from these scholarly communities have grown apart and lack the integration that helped to create the interdisciplinary investigations of early peace research. This Handbook brings these perspectives together to encourage a more integrative approach to the study of intergroup conflict and peace. With insightful chapters from key social psychologists and peace scholars, this volume offers an extensive overview of critical questions, issues, processes, and strategies relevant to understanding and addressing intergroup conflict. 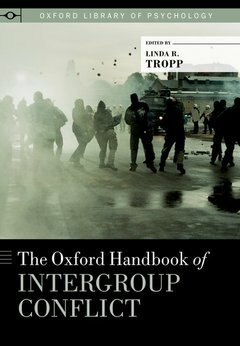 Chapters on sources of intergroup conflict examine dynamic processes in intractable conflict, ideological bases of conflict, and processes of delegitimization and moral exclusion. Other chapters on the perpetuation of intergroup conflict highlight processes associated with retribution and revenge, group identities, historical memories, victimization, and divergent perspectives between groups in conflict. Authors review strategies for reducing and resolving intergroup conflict using a variety of interventions that may be useful at different stages of conflict, with particular emphasis on strategies such as intergroup contact, dialogues, and interactive problem solving. Finally, the authors survey the ways groups can move beyond conflict, exploring topics such as the prevention of genocide and mass violence, reconciliation, apology and reparation, transitional justice, and approaches to building sustainable peace. In a concluding chapter, Herbert Kelman offers reflections of past and current efforts to bridge social psychological and peace perspectives on intergroup conflict and peace. This Handbook will provide a more integrative and cohesive foundation for research- and practice-oriented scholars who seek to develop effective approaches for reducing and resolving conflict and promoting peaceful relations. Part One: Introduction. 1. Understanding and Responding to Intergroup Conflict: Toward an Integrated Analysis. Linda R. Tropp. Part Two: Sources of Intergroup Conflict. 2. Why Do Conflicts Become Intractable? The Dynamical Perspective on Malignant Social Relations. Robin R. Vallacher, Peter T. Coleman, Andrzej Nowak, and Lan Bui-Wrzosinska. 3. Conflict, Delegitimization, and Violence. Daniel Bar-Tal and Phillip L. Hammack. 4. Ideological Bases of Violent Conflict. J. Christopher Cohrs. 5. The Scope of Justice, Intergroup Conflict, and Peace. Susan Opotow. Part Three: Perpetuation of Intergroup Conflict. 6. Retribution and Revenge. Brian Lickel. 7. Group Identities. Sonia Roccas and Andrey Elster. 8. Remembering Intergroup Conflict. Rezarta Bilali and Michael A. Ross. 9. Collective Victimization. Johanna Ray Vollhardt. 10. Divergent Intergroup Perspectives. John F. Dovidio, Tamar Saguy, Tessa V. West, Samuel L. Gaertner. Part Four: Strategies for Reducing and Resolving Intergroup Conflict. 11. Interventions Aimed at the Reduction of Prejudice and Conflict. Elizabeth Levy Paluck. 12. Intergroup Contact. Ulrich Wagner and Miles Hewstone. 13. Intergroup Dialogue: A Critical-Dialogic Model for Conflict Engagement. Biren (Ratnesh) A. Nagda, Anna Yeakley, Patricia Gurin, and Nicholas Sorensen. 14. Addressing Intractable Conflict Through Interactive Problem-Solving. Tamra Pearson d'Estree. 15. Peace Interventions Tailored to Phases Within a Cycle of Intergroup Violence. Daniel J. Christie and Winnifred R. Louis. Part Five: Moving Beyond Intergroup Conflict. 16. Genocide, Mass Killing, and Violent Conflict: Prevention and Reconciliation. Ervin Staub. 17. Intergroup Reconciliation: Definitions, Processes, and Future Directions. Arie Nadler. 18. Apology and Reparation. Aarti Iyer and Craig Blatz. 19. Transitional Justice and Intergroup Conflict. Brandon Hamber. 20. Building Sustainable Peace and Compassionate Community. Kevin Clements. Part Six: Conclusions. 21. Social Psychology and the Study of Peace: Personal Reflections. Herbert C. Kelman. Linda R. Tropp, Ph.D., is Associate Professor of Psychology and Director of the Psychology of Peace and Violence Program at the University of Massachusetts Amherst.